Yes, I've set a day of the week when I go to the library. I had to do this mostly to keep myself from showing up there every day and taking away more books than I could read in the borrow period. I get kind of book-happy and can't control myself. That would be why my personal TBR pile is so big. My book-addicted brain: "We have 100 books to read already...running out of space on the shelves... butthisbooklookssoawesomeanditsonsaleBUY!" I know that most of you understand the feeling. Anyway. A once a week library trip keeps my book borrowing below the certifiably insane level and gives me a goal for the week. I can't check out any more books than what I return, so if I only read 2 books from my library pile that week I can only check out 2 new ones. I know... I know. It sounds so restrictive and self-abusive!!!! But, it's been working for me so far. Anyway, I've got a review for you guys today so read on! Not bad, Guibord. Not bad. It wasn't the most riviting of YA fantasy that I've ever read but it was entertaining and I got through the whole book in just a few sittings. There were some slow parts, and a bit of repetition but overall it was cute. A very unique idea. Tessa finds a funk tapestry in a big crate of old books. The tapestry is so powerful that it pulls her back hundreds of years to a past-life that connects her very strongly to the owner of the tapestry and subject... a gorgeous, but angry looking, unicorn. There's a lot of getting pulled back and forth in time, and Tessa's friend is a little irritating. Other than this, though, everything else is up to par as far as entertainment and creativity. The Norn are properly anti-emotion, and that part of the story evolved pretty well. William is your average teen-dream-boat with an English accent, not a lot of depth there unfortunately. Tessa is a pretty interesting character herself but I wish the author would have gone into more detail regarding her personality and thoughts about things such as her artwork and her mother's death. Anyway, I would say that this is a fantastic book for younger girls. 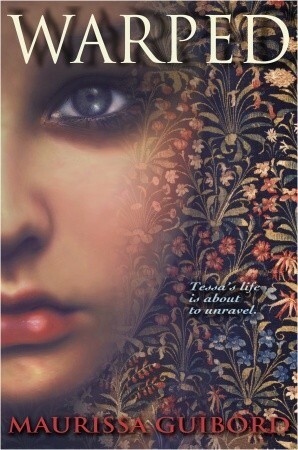 Though the main character is in her teens, I would be more inclined to recommend this book to a pre-teen or young teen. It's quick and doesn't linger on any one particular subject to give it too much depth or weight. It's generally light hearted. So, a 3/5. Not at all bad, but not exactly a book I'd consider picking up a second time. That's all for this Thursday post, my dolls. See you tomorrow for Feature and Follow Friday (NEW AUTHOR BEING FEATURED!) and a great GIVEAWAY! WOO!